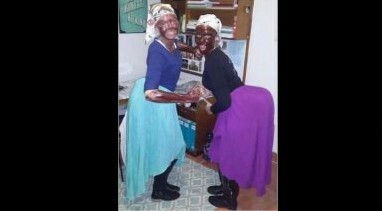 AFRICANGLOBE – Two South African students posted a photo of themselves in blackface, prompting a school disciplinary response and reigniting a social media conversation on racism in South Africa. The photo of two women from the University of Pretoria dressed as Black domestic workers was deleted from Facebook, but was swiftly disseminated on Twitter. A university official said that the students would be disciplined for harming the school’s reputation. The University of Pretoria (UP) has launched an investigation into “possibly” racist behaviour after two White female students were photographed in domestic worker outfits with Black paint smeared on their faces and arms. “The investigation began yesterday,” UP spokeswoman Nicolize Mulder said on Wednesday. The picture, which had reportedly gone viral on social networking sites, was published in Beeld and The Times on Wednesday. It shows the two posing with padded bottoms. Mulder said the picture was taken at a private 21st birthday party but because they were students at the institution, action would be taken. “Because the students are registered UP students who by their actions brought the name of the university into disrepute, disciplinary steps against the students have been taken,” she said. The South African Human Rights Commission said it was not investigating the case as it did not receive a complaint. “We didn’t receive a complaint in this matter. We just learnt about it in the media,” said spokesman Isaac Mangena. ALSO SEE: Kleinfontein: A Place Where Only Whites Can Live, Oh Yeah, It is In Africa!